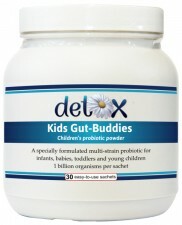 A specific probiotic powder formula suitable for babies, toddlers and children. It contains 7 strains of naturally-occurring beneficial organisms (1 billion organisms per sachet), including the child-specific Bifidobacterium infantis strain, as well as the prebiotic FOS (Fructooligosaccharide). children of all ages, especially those who cannot swallow capsules and tablets - this probiotics blend is in an easy-to-take powder, individually packed in sachets. 1 sachet to be given to the child daily with or after food for a period of at least 15 days, or as advised.